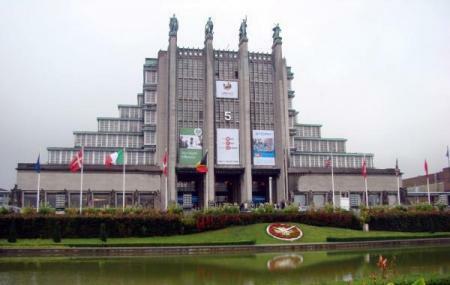 The exhibition halls of this center became famous in the 1958 Expo and they have not slowed down. The Art Deco structure has just kept on getting bigger over the years and today is the city’s foremost event area. It’s right outside the Atomium. There’s always something exciting going on, over a 100 events every year. More than 2 million people visit annually. Check the Expo website for current and upcoming events. Check out the water feature in Hall Five. Admission fees depend on the event. Hours depend on the event. How popular is Brussels Expo? People normally club together Place Du Luxembourg and Train World while planning their visit to Brussels Expo. Several different halls where all kinds of things can be organized. Most halls offer the same infrastructure inside. Both public and private events are organized here. Outside you can find one of the most famous landmarks of Belgium : the Atomium Some of the major events take place here. Depending on the event of the moment, it can be free or paying entrance. With a wheelchair you can enter not that easily, doors are not really that wide. But you can definitely enter if you have a little help. There are several elevators that can take you from one floor to another. I have been lots of times to Brussels expo for several events. Brussels expo is a very beautiful and huge event location. What I notice each time is that there is always a lack of parking, and the paid parking is super expensive. Food availability is limited and super expensive for what you get. Make sure that you arrive with a full stomach! Last event that I attented was the ‘Autosalon’ which was very beautiful in the Brussels Expo’s halls.